The Spanish Civil War also gave us Homage to Catalonia by George Orwell, an all time classic – read it! By the late 1930’s, many people believed that a massive clash was inevitable between the forces of fascism, led by Nazi Germany, and communism, led by the Soviet Union. Demonstrations and street battles took place between supporters of both ideologies all across the world. Despite the tragic lessons of the First World War, militaristic governments increasingly saw war as a viable option to get what they wanted. Wars of aggression were already being fought in Ethiopia (invaded by Italy in 1936) and China (invaded by Japan in 1937.) It was only a matter of time before the rest of the world followed. When a fascist general attempted to overthrow the elected government of Spain in 1936, a civil war began. Germany and the Soviet Union supported opposite sides in the war and both powers used it as a dress rehearsal for the larger struggle to come. In an open secret, German and Soviet personnel even participated in the fighting, which was eventually won by the fascists in 1939. In August 1939, the narrative for the coming war was derailed with the Nazi-Soviet pact. In a move that shocked the rest of the world, an agreement was made between two powers thought to be deadly enemies. Hitler and Stalin callously agreed to each look the other way while they carved up control of Eastern Europe between them, beginning with Poland. Nazi Germany made the next move. In September, assured that the Soviet Union would not interfere and ignoring Britain and France’s warnings, Germany invaded Poland, ostensibly to take back ethnic German lands lost in the First World War. Britain and France declared war in support of Poland and World War II in Europe began. The Nazis swiftly conquered Poland using a new style of mobile warfare known as blitzkrieg. Emphasizing deep strikes with tanks and other vehicles and coordinating with air attacks, the Germans shattered expectations for the same long, drawn out trench warfare as the First World War. Poland fell after a month and, as agreed upon, the Soviets took over its eastern half. Within a year, nations in Scandinavia and Western Europe, including, most shockingly, France had all fallen under Nazi rule. Britain was saved from invasion by its fleet and its air force. Germany continued its war of conquest in the Balkans and North Africa. While staying neutral so far, Stalin was preparing for a fight with Germany that still felt inevitable. 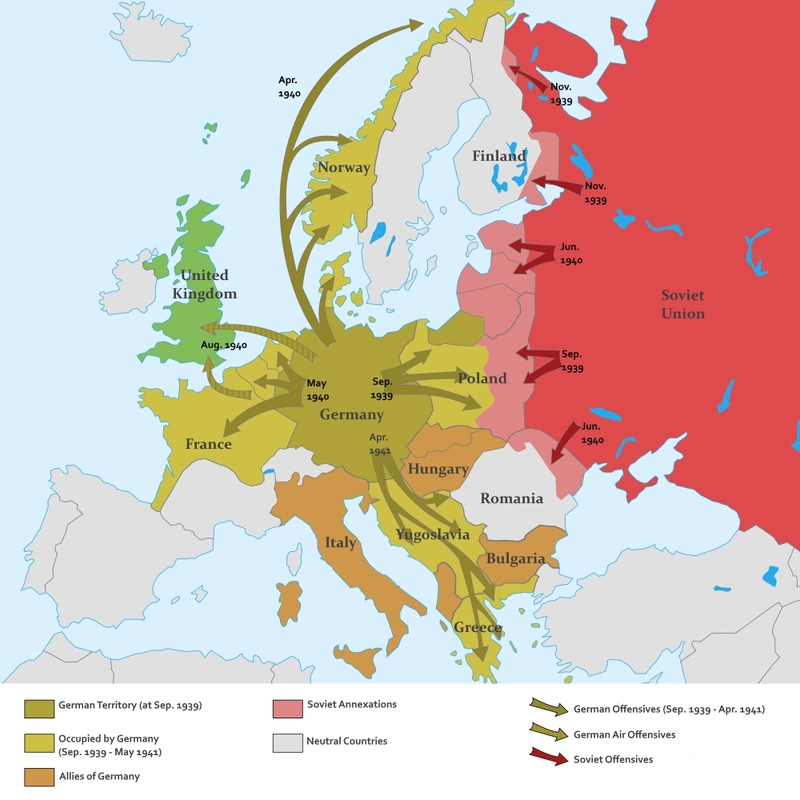 As the West was occupied with Hitler’s conquests, the Soviets seized the Baltic nations, as well as land from Romania and, after a bitter war that exposed many problems within the Red Army, parts of Finland. Within German occupied lands, the Nazis continued their pre-war persecution of Jews, as well as Roma, gays and lesbians, political opponents, the mentally and physically impaired and anyone else deemed unworthy of the Third Reich. Jews were rounded up and murdered on the spot or confined to ghettos and concentration camps. The Nazis made preparations for mass murder on an industrial scale. On June 22, the largest invasion force in history was ready: nearly 4 million soldiers, over 3,000 tanks and almost as many aircraft. War between the two largest military powers in the world would unleash catastrophic death and destruction, not only in terms of its scale, but in its cruelty and hatred. The Second World War: A Short History, by R.A.C. Parker – This is exactly what it says it is: a short history of World War II. A lot of events and complexities are glossed over, but for such an overwhelming topic, it’s a terrific entry point for further research.